GoodReads: In a pursuit that has spanned continents, Iolanthe, Titus, and their friends have always managed to remain one step ahead of the forces of Atlantis. But now the Bane, the monstrous tyrant who bestrides the entire mage world, has issued his ultimatum: Titus must hand over Iolanthe, or watch as his entire realm is destroyed in a deadly rampage. Running out of time and options, Iolanthe and Titus must act decisively to deliver a final blow to the Bane, ending his reign of terror for good. 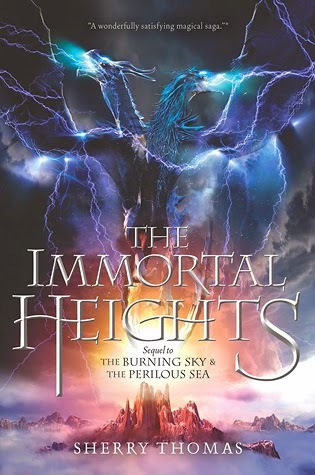 The Immortal Heights picks up where The Perilous Sea left off, and follows Iolanthe's and Titus's journey to take down the Bane. I have to admit that I was kind of bored with the romance. I mean it was nice, but nice is all I can say about it. For me, it just didn't have the same level of swoons as it did in the previous books. No, it was the action that had me flying through the pages of The Immortal Heights. It's action packed right from the start, and at the end of each chapter there's a kind of cliffhanger that begs you to read on... the phrase 'just one more chapter' comes to mind. I loved Iolanthe's selflessness and her determination to protect the ones she cares for. Despite not loving the romance in this one I still appreciated her relationship with Titus, it's great seeing a couple who are so open with one another. Titus doesn't hide his fear from her and also knows when to step back and let her take charge. Her relationship with Master Haywood was also really sweet, I want to see more father/daughter type relationships like this one. All in all, it was a satisfying conclusion to the trilogy. Book one, however, remains my favourite! Oh it's a shame that this one didn't have as many swoony feels as the first one, Renu.